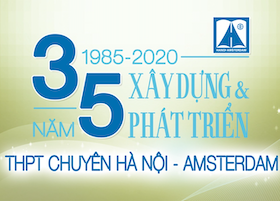 Along with Ngo Duc Phuong, a student from Pham Hong Thai high school, the tenth-grader Tran Khanh Linh from Hanoi – Amsterdam high school had the honor of being crowned the Beauty of Trang An. The contest “the Beauty of Trang An 2012”, which was partly sponsored by Hanoi Youth Union, was held with a view to promoting the inner beauty and the gentility of Hanoi’s students as well as lending them guidance on beauty judgment. After three elimination rounds, the judging panel had narrowed down the list from 1,726 applicants to 20 outstanding contestants (10 boys and 10 girls), who would go on to participate in the final competition. Duong Thanh Hue, a contestant who has the loveliest countenance. Unlike many other beauty contests for students, this competition lent significance to the appreciation of school uniform. The contestants were asked to adorn themselves with polite and urbane clothes, boys wearing suits and girls wearing either ao dai or blouse-skirt suits. In addition, the knowledge about Transportation was also accentuated as all 20 contestants pitted their skills against one another’s in the ten-question round whose theme was the understanding of Transportation Law. All the excellent students answered correctly, showing their in-depth understanding of the subject. The contestants showed their knowledge of transportation on the stage by giving correct answers to all the questions. After that round, ten contestants who had gained the highest scores went on to compete in the Talent round. The excellence of their performances, which was greatly admired and extolled by the audience, showed the considerable effort each student had made to prepare for the competition. Then, six contestants who received marks with flying colors from the judging panel appeared in the final round, the Response round, where they were required to voice their thoughts on a myriad of issues such as the role of teachers in the modern world, environmental pollution, vulgarity, and the characters of Hanoi’s people. Duc Phuong and Khanh Linh at the Beauty of Trang An. In the end, of the 17 titles given to the contestants, three were given to Tran Khanh Linh who had the most impressive performances in the Response round and the Talent round. Tran Khanh Linh, along with Ngo Duc Phuong ( from Pham Hong Thai high school), was crowned the Beauty of Trang An. The “Lotus dancing” performance of a student form Marie Curie high school, Hoang Phuong Anh who later won the Runner-up prize. Pham Quynh Anh, a Chu Van An student who won the school uniform title. Tran Khanh Linh with her three titles.